Between 1767 and 1769, a church was built little by little at the same time the Barrio de los Avellanos was being populated, where mainly potters and dairymen settled. This sanctuary is the second most important religious building in the city. Its construction began in 1767 and was completed 22 years later, in 1789. Its façade is an exuberant Baroque, consecrated by its filigree stone. The interior of the sanctuary has a sculptural and pictorial decoration of great quality. The place worth’s the public admiration due to its beautiful pulpit made in “tecali”, volcanic stone similar to marble, and the four paintings of the pendentives with the four apparitions of the Virgin. The picture of the Virgin was made by José de Alcíbar in the second half of the 18th century. 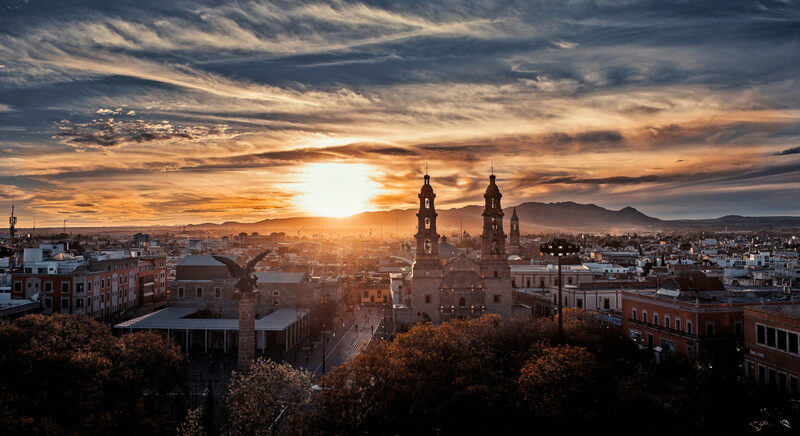 At the beginning of the seventeenth century, efforts to determine the progress of Aguascalientes began to bear fruit, which led to the arrival of indigenous immigrants who settled on the west of Aguascalientes and founded the Barrio de San Marcos. This bullring was built in a record time of 48 days. It was inaugurated on April 24, 1896, with a luxury corrida sign and an impressive full. The close relation of the Fair of San Marcos with the bullfighting spectacle dates from that time. Since 1988, due to its small size, it is used as a bullfighting school and for bullfighting festivals. 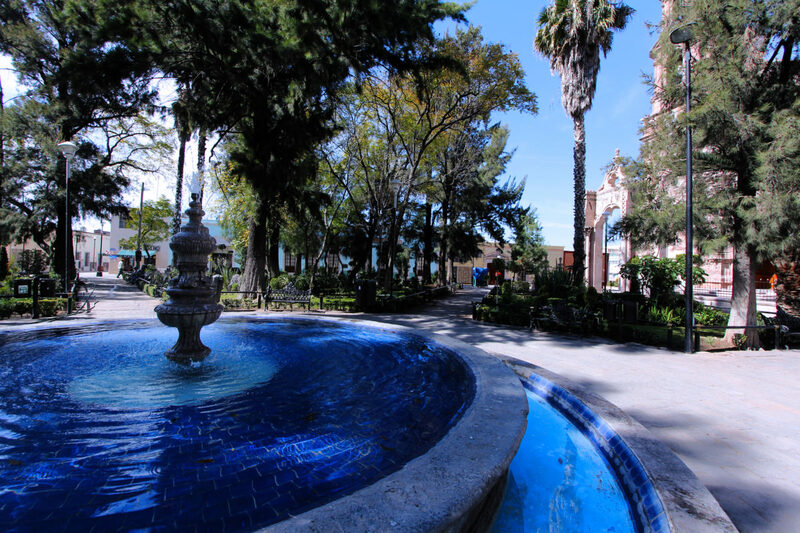 The Garden of San Marcos, with its balustrade in pink quarry of neoclassical style, is a symbol that characterizes Aguascalientes anywhere; full of customs and traditions, it is also the heart of the highly recognized National Fair of San Marcos. Its construction dates from 1842. The new arena was built in 1974 and has been expanded to accommodate 15,000 people; In it, the best exponents of bullfighting art have been presented. On its north side is the statue of “Armillita”, the most famous bullfighter in Aguascalientes. Founded in the 16th century by Andalusian immigrants, it stood out in the beginning for its leafy orchards and large houses, and for always being a neighborhood linked to the art of bullfight. The construction of the temple concluded in 1796 and every November 13 is the scene of popular fervor in honor of the Black Christ of the Encino, as it commemorates its miraculous appearance: it is said that a neighbor of the city, cutting the trunk of an oak, found within him the image of Jesus Christ. The extraordinarily large-scale paintings placed inside the visitor’s attention are strongly attracted by the Vía Crucis, a pictorial collection made in 1798 by the master Andrés López. It was inaugurated on September 16, 1890. It has an inscription in tile panels, recalling both the foundation of the Barrio de Triana, which took place on June 7, 1565, and its first settler: Don Hernán González Berrocal. It consists of a small wooded garden with pines, palms and some flowers. It is decorated by some iron benches and a central fountain of tile panels. Adjacent to the Encino temple, once its priest house, the Museum dedicated to the famous engraver José Guadalupe Posada, born in 1852, was installed. Its corridors and halls were adapted expressly for the exhibition of the original works of the engraver, whose revolutionary’s themes are festive critics to the government regime of his time. At the end of the 19th century and the beginning of the 20th century, the current train station was built. Today is one of the few that preserve its original condition, surrounded by the general workshops of construction, repair of machines and rolling stock of the early 20th century, becoming one of the largest in Latin America. 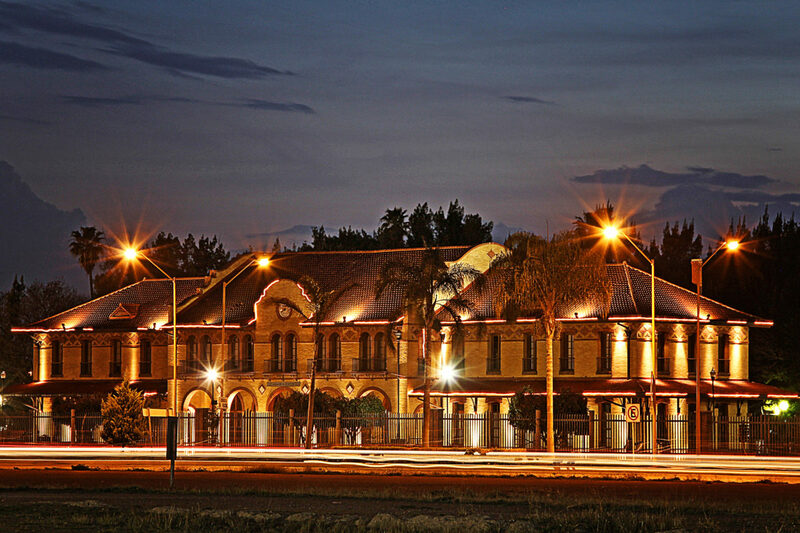 It is a beautiful building, flanked by wide platforms, waiting room, office for ticket sales, mail, traffic control room, warehouse, etc., which since 2003 is part of the historical and cultural complex Plaza de las Tres Centurias, and that has preserved an iconic space of the origins of Aguascalientes. Among the main attractions are the Dancing Waters, the Children’s Train, the Monument to the Locomotive, a Site Museum, the Plazoleta de los Manantiales and the traditional Station Garden. It is located in the building of the Cargo Warehouse, which had the function of weighing and distributing the various merchandise that would be transported through the express’s cargo service. 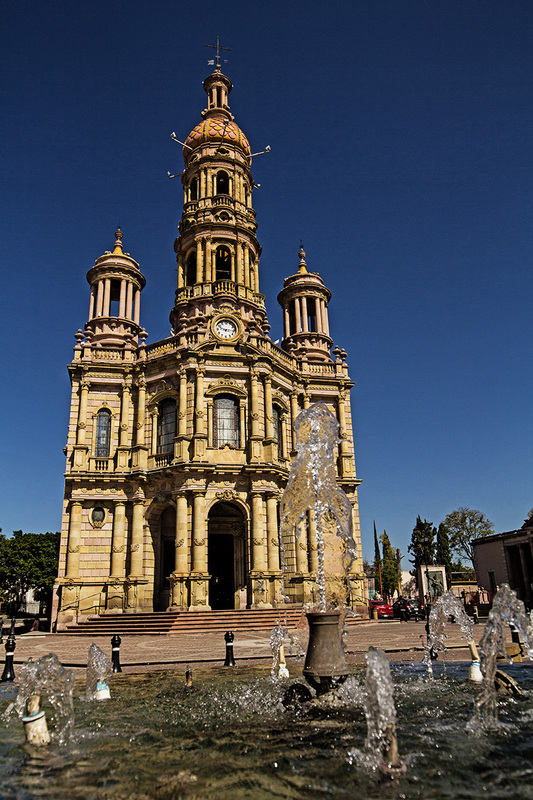 It currently houses a collection of more than ten thousand pieces of machinery, tools, equipment and documents of railway infrastructure, whose objective is to disseminate the history of the national rail system and its economic, political, social and cultural impact on the development of Aguascalientes at the beginning of twentieth century. These baths are also called the Big Baths. During the Colonial Period, natural ponds and ditches were formed in these lands with thermal waters. The Ojocaliente spring was the most important source of water supply in the city since its foundation, opening to the public for recreational purposes in the middle of the last century and being one of the first sites of tourist interest that the city had. The hydraulic architecture and services of this building have had modifications over time. “Los Arquitos” Baths were the first built for the pleasure of the inhabitants, since the Ojocaliente had a medicinal character from the beginning. 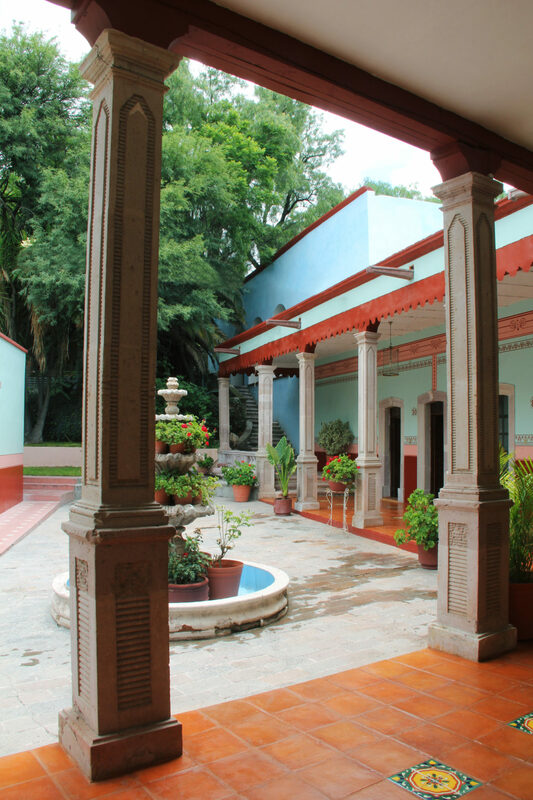 Its construction with neo-Gothic arcade dates from 1821, consisting of 13 pleasures or tubs, four outdoor baths, an orchard, a set of public washrooms and a pool, known as La Puga. Currently, it lodges Los Arquitos Cultural Center, where classes of different artistic disciplines are taught, also serving as a cultural forum. 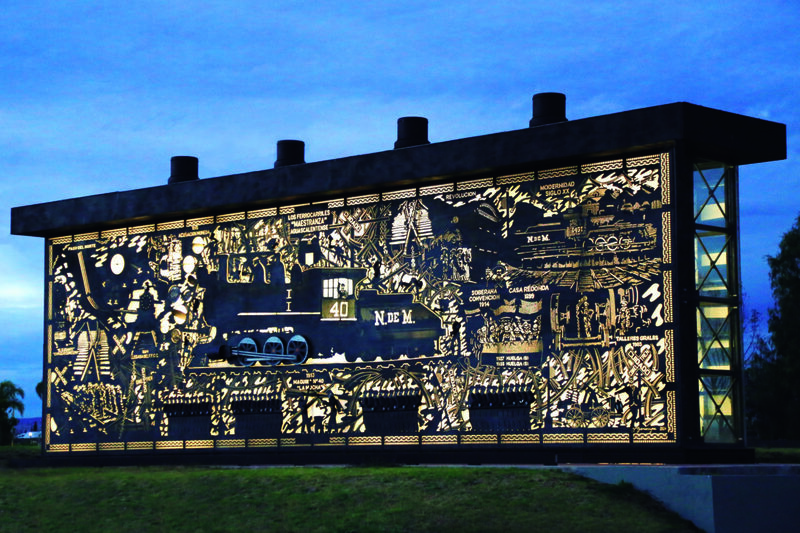 Technological show of light and sound that is carried out on a dynamic five-meter mural, based on mechatronic technology to narrate and illustrate in a very didactic and entertaining way the history of the railroad in Aguascalientes. The name of La Maestranza is due to the teachers who learned to work in the railroad workshops, beginning as newbies, teaching the new ones and becoming teachers; repeating the cycle for more than 100 years. The University of Arts is located in the central part of the Tres Centurias Ferrocarrilero Complex, in the heart of the city of Aguascalientes, integrated by the School of Dance, Visual Arts and Music. It’s physically located in one of the most representative and symbolic spaces of the industrial heritage of the state of Aguascalientes, occupying the building of what was the “House of Force”, which distributed water and energy for more than 200 engines for 80 years. 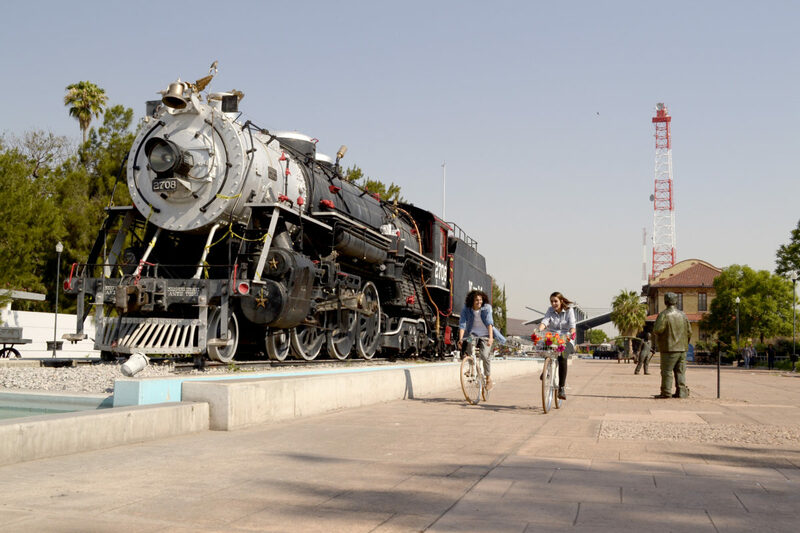 In this place, the first proudly Mexican locomotive was built: La Máquina 40. Over the years, the State Government has managed to rescue this railroad treasure keeping the essence of the place and integrating present elements to offer visitors an historic vanguard place. The space of 7 thousand square meters offers a capacity for two thousand four hundred people in a banquet type assembly and three thousand four hundred in auditorium type. It is a new concept to bring the population closer to art and its possibilities. It occupies the space of the old railroad workshops, with 6,000 m2 of exhibition space. The reflection is propitiated by the aesthetic experience and activities of academic and research that are carried out in its facilities, adjacent to the University of the Arts.